On Sunday, the Turksish Armed Forces and pro-Ankara militants reached the outskirts of al-Bab, controlled by ISIS after capturing the areas of Swesian, Hazwan, Qadiran, Al-Dana and ‘Awla. The Ankara-led forces are now deployed in about 2 km from al-Bab and readying to storm it. Turkey’s battle tanks and artillery are shelling the town. Air strikes by the US-led coalition’s air power are also reported. The recently appeared photo shows two fighters of the so-called Free Syrian Army (FSA) with the Chinese-made FN-6 man portable air defence system (MANPAD) in northern Aleppo. FSA units, operating under the banner of the Operation Euphrates Shield, receive supplies and are embeded with the Turkish army and Special Forces.They have been hardly able to obtain this modern surface-to-air missile without order from Ankara. If supplies of MANPADs to the FSA in northern Syria are confirmed, it will be an important signal that Turkey is considering the plan of military confrontation with the Syrian military after the seizure of al-Bab from ISIS. Militants launched a toxic gas attack near the international airport in the city of Aleppo on Sunday, using projectiles with poisonous gas during the artillery shelling of the Syrian army’s positions. At least 28 Syrian servicemen were reported injured. The Syrian army’s Tiger Forces, the Desert Hawks Brigade, Hezbollah, Harakat Hezbollah al-Nujaba, the Syrian Social Nationalist Party (SSNP) and other pro-government groups are preparing to relaunch offensive operations in multiple fronts inside and outside Aleppo city. 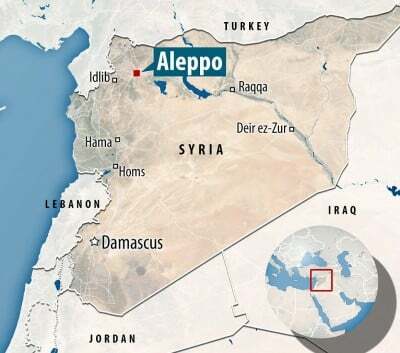 The operations will be supported by the Syrian Air Force and the Russian Aerospace Forces from the air and by Russian and Iranian military advisers on the ground. On Sunday, the army and its allies, using loud speakers, gave militants remaining in eastern Aleppo 24 hours to surrender. The preparations followed the collapse of Jabhat al-Nusra & Co defenses in western Aleppo that lead to liberation of the areas of al-Assad and Minyan. The government forces also liberated the villages of Kafr Haddad and Khirbat Al-Zuwari in the southern Aleppo countryside. “Moderate oppositioneers” from Jabhat al-Nusra face hard times as president-elect Donald Trump is preparing to enter the office. On November 12, a pro-militant media outlet, Step News, released a video of the US Air Force’s A-10C and F-15E warplanes, flying over southern Idlib. At least 1 air strike was reported. Crews of Tu-160 and Tu-95 long-range strategic bombers are on combat alert in the Engels Air Force Base in the Russian region of Saratov, the Russian state-run TASS news agency reported Sunday, citing a military diplomatic source. According to the report Tu-160 and Tu-95 strategic bombers were prepared for combat missions and loaded with cruise missiles. The Russian strategic bombers, Tu-160, Tu-95 and Tu-22M have been involved in the Russian military operation in Syria since its start in 2015. At the same time, the Russian Navy’s task force for Syria is also reading for combat missions in the country. The commander of Russia’s flagship Admiral Kuznetsov aircraft carrier Sergei Artamonov confirmed on Saturday a flotilla of Russian warships is now in the eastern Mediterranean off the Syrian coast. He said that the battle group reached the designated zone and aircraft are already taking off from the ship’s deck to view the conflict zone. The battle group is ready to launch combat missions in any time.